Melbourne Recital Centre believes that music should be available to all Victorians no matter where they live. Working in partnership with regional presenters from across Victoria, with the support of Creative Victoria and private support, we look forward to bringing music to your region soon. Between 2015 to 2018, Melbourne Recital Centre has curated and delivered more than 85 concerts in Ballarat, Benalla, Bendigo, Birregurra, Charlton, Castlemaine, Daylesford, Geelong, Healesville, Kerang, Portland, Mildura, Montrose, Mount Beauty, Stratford, Traralgon, Upwey, Wangaratta, Warburton, Warrnambool to more than 4700 people. Superb touring artists are selected from those who perform concerts at Melbourne Recital Centre, including international, interstate and local musicians. 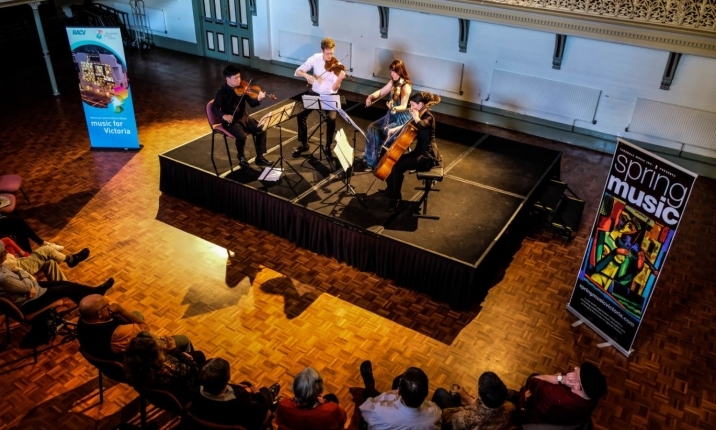 Past artists have included Australian icons Paul Grabowsky and Vince Jones at Ballarat Mining Exchange, Finnish pianist Paavali Jumpanen at Mildura Arts Centre, Hungarian-style gypsy folk trio Stiletto Sisters on the lawns of the Kerang Town Hall and Australia’s acclaimed classical music ensemble TinAlley String Quartet at Upper Yarra Arts Centre in Warburton. Pre-concert talks, post-concert artist meet & greets and workshops for young people are also popular auxiliary events. Concerts are supported by the Victorian Government through Creative Victoria’s Touring Victoria Program and a private donor. Melbourne Recital Centre curates programs specifically tailored for regional audiences. We liaise with local presenters to create one-off concerts or a series of concerts according to your dates, venue and artistic preferences. Melbourne Recital Centre does all the contracting and invoicing with the artists and supplies marketing materials to the presenter. The local presenter is responsible for marketing and presenting the concerts. For first-time-presenters, Melbourne Recital Centre covers costs associated with artist fees, travel and accommodation where necessary. The presenter pays for venue and marketing costs but keeps all box office takings. For returning presenters, Melbourne Recital Centre arranges an appropriate contribution towards artist-related costs.